As an intern at the Delaware Nature Society, I help out with a number of different camps this summer. I was lucky enough to accompany the Beginning Backpackers led by Brad Reynolds this past week. We wasted no time lacing up our hiking boots and hitting the trails. After a number of day-hikes to prepare for our overnight, our group hiked 6 miles on Thursday from Ashland Nature Center to Bucktoe Creek Preserve to camp for the night. We had to then retrace our steps back to Ashland the following day without our fearless leader and guide Joe Sebastiani, Seasonal Programs Team Leader. While there were a couple veteran campers returning for the second year, for many of the other campers, this trip was their first time camping. The hike from Ashland to Bucktoe crosses the Delaware Nature Society’s Red Clay Floodplain property, Auburn Heights State Park, Auburn Heights Preserve, private properties, and Bucktoe Creek Preserve. This hike can be characterized as exclusive because the Delaware Nature Society receives permission to cross private property; these are the only campers that will trace this unique path this year. 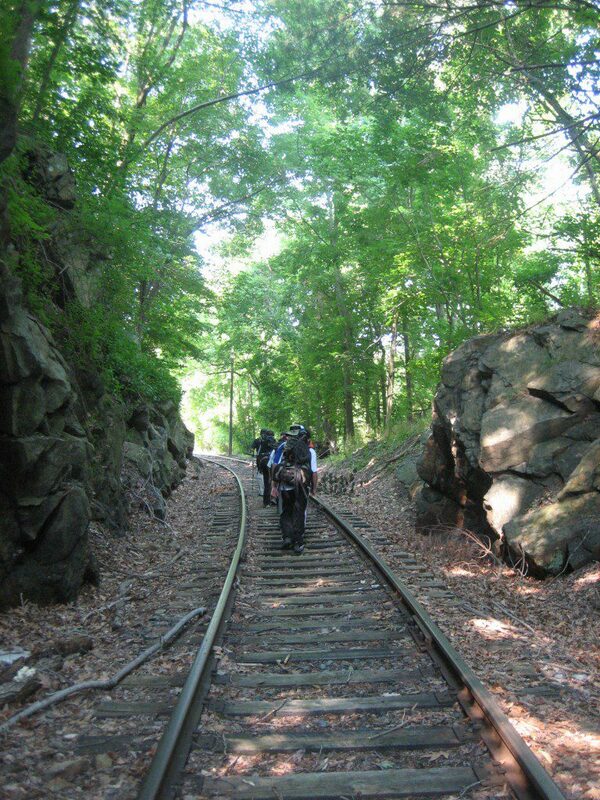 The route from Ashland to Bucktoe follows old railroad tracks that pass through Piedmont rock outcrops. As one of our first rest stops along the way, these cool, wet rocks were quickly dubbed as “natural air conditioning” as the kids took a break to lean up against them seeking relief from the humidity and heat. Many of the properties did not have specific trails to follow, so we blazed our own trails. Pants were essential for this hike to avoid (or at least attempt to avoid) stinging nettle and ticks as the campers bushwhacked through dense vegetation and trekked through fields, some with grass as high as their shoulders. “It was so pretty!” said Izzy, commenting on the areas where we were hiking. 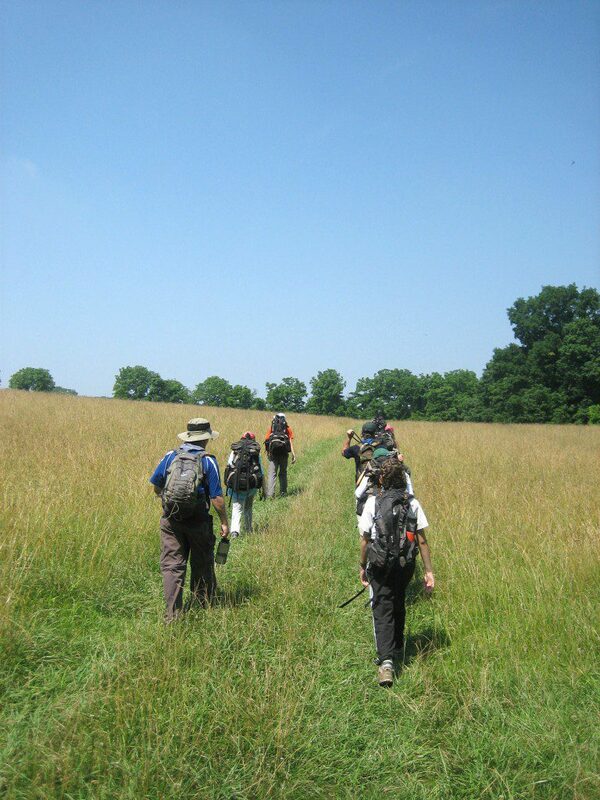 “It felt like we went so far because of so many different landscapes we walked through. I saw things you only see in National Geographic or movies!” They remained in good spirits as they kept trudging forward, pushing themselves physically and mentally towards the goal of our camp at Bucktoe. 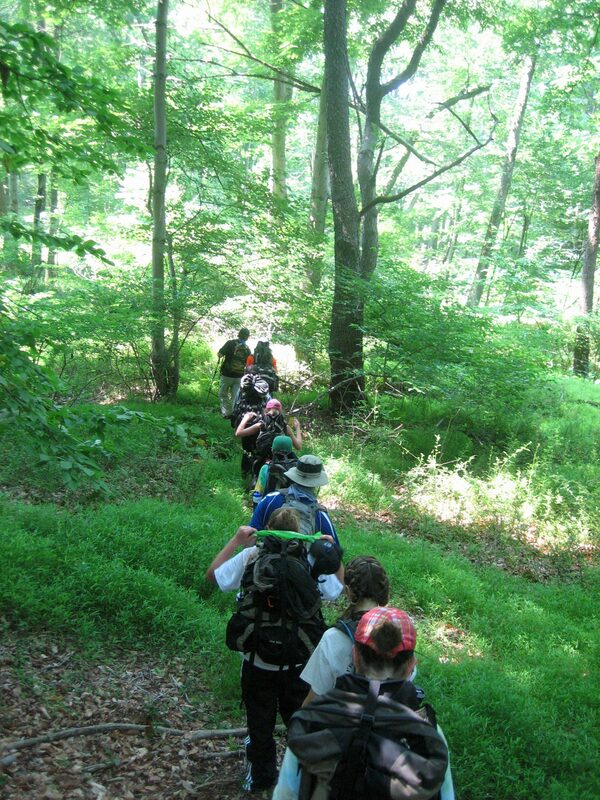 Blazing our own trails through the Delaware wilderness! We crossed open fields in the hot sun a few times. Obviously, we drank lots of water! After we got to camp, we dropped off our backpacks and headed down to the creek to cool off. Most of the girls shredded their boots to sit in a deeper part of the water, while the boys preferred to skip rocks or explore along the banks. Laura, Michael, Izzy, and Iris taking advantage of the cool Red Clay Creek. Over the two days of hiking, we saw a variety of different wildlife. We saw a wood duck mother and her ducklings in the Red Clay Creek and another in Bucktoe Creek Preserve. The fields were lined with milkweed attracting a number of Monarch Butterflies. We also saw a rare Pipevine Swallowtail, a beautiful kind of swallowtail due to its black and iridescent blue wings. A snapping turtle played camouflage among the rocks in Bucktoe Creek, and both Colby and Kerry found a newt during their explorations. We saw White-tailed deer fawns scampering through the brush ahead of us and the boys glimpsed a fox as they walked up to the picnic tables for breakfast on Friday morning. Grace really enjoyed the assortment of wildlife we saw on our trip. “I don’t see those every day!” she said. 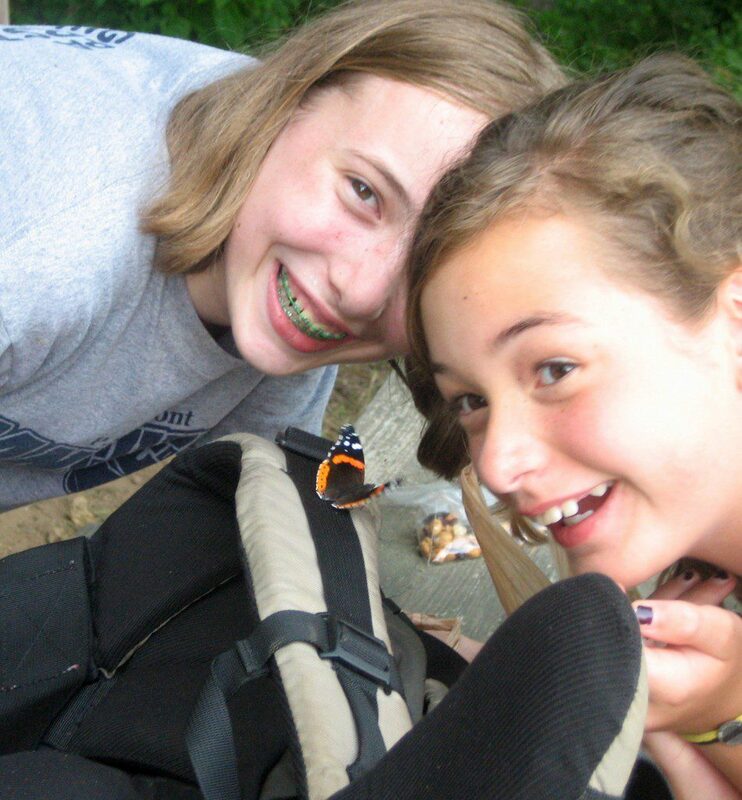 Iris, Grace, and Izzy were super excited about the Red Admiral butterfly that decided to hang out with us for a bit at the picnic table before dinner on Thursday night. In late May, Jim White and I traveled to the South Carolina Lowcountry at the invitation of the Lowcountry Institute on Spring Island. The objective? To develop a new travel program for the Delaware Nature Society. Jim and I think we have a fantastic trip in the making for you to participate in next spring. Joe checking out the scene in the ACE Basin, which is a 350,000-acre Lowcountry wild area of made up of several S.C. Wildlife Management Areas, a National Wildlife Refuge, and many large private natural areas southwest of Charleston. Wildlife abounds here. We stayed on Spring Island, home-base for the Lowcountry Institute, an environmental non-profit organization charged with environmental education and conservation in southeastern South Carolina. Spring Island is a nature reserve first, and a residential area second. In fact, you really don’t see houses on the island. You see forest, tidal marsh, freshwater ponds, and lots of wildlife. According to Thomas Blagden, Jr., author of Spring Island: Rhythms of Nature, the island…”is a quintessential Loucountry marsh island. Perhaps what distinguishes it most is its status as the visionary domain of a group of private residents who have placed the quality of their natural surroundings as their highest priority.” Luckily, and coincidentally, Matt Sarver, President of the Delmarva Ornithological Society, has in-laws that own a property on the island, and that is where we stayed. Matt accompanied us on our trip and was our host, tour guide, and chauffeur. Not bad! 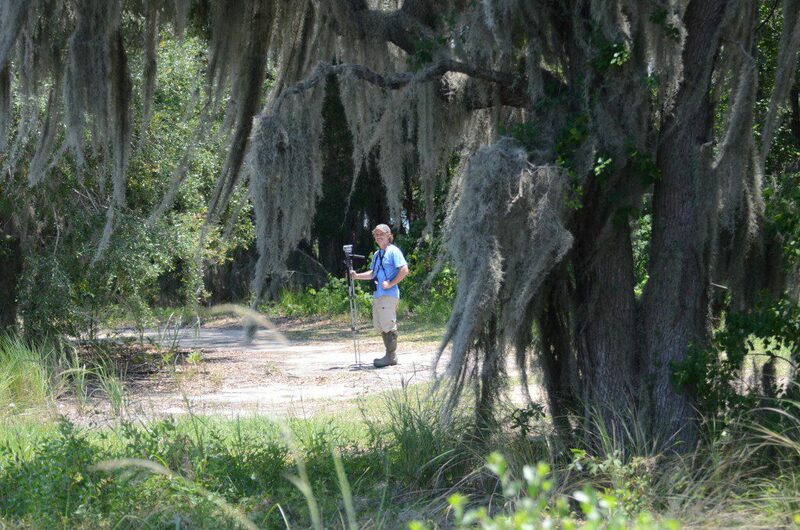 Jim and I toured many areas to get a feel for the natural aspects of the Lowcountry. Matt and the staff at the Lowcountry institute developed a schedule and accompanied us on our tour. We visited ACE Basin, Savannah National Wildlife Refuge, various private nature preserves, and a tern and pelican nesting island on the Georgia/South Carolina border. Our trip next year will include all of these destinations and much more. ACE Basin is huge. It is where the Ashepoo, Combahee, and Edisto Rivers combine to form one of the largest undeveloped estuaries on the east coast. This area attracts many bird species that are more commonly known from south Florida. 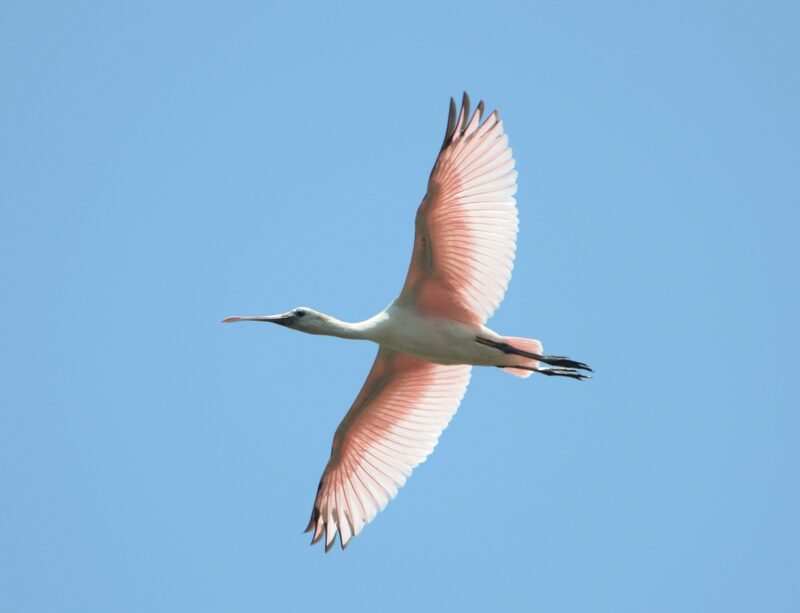 We saw Roseate Spoonbill, Reddish Egret, Mottled Duck, Black-bellied Whistling Duck, and American White Pelican. Vast wetlands attract shorebirds, wading birds, and raptors like Mississippi and Swallow-tailed Kites. Reptiles and Amphibians abound. 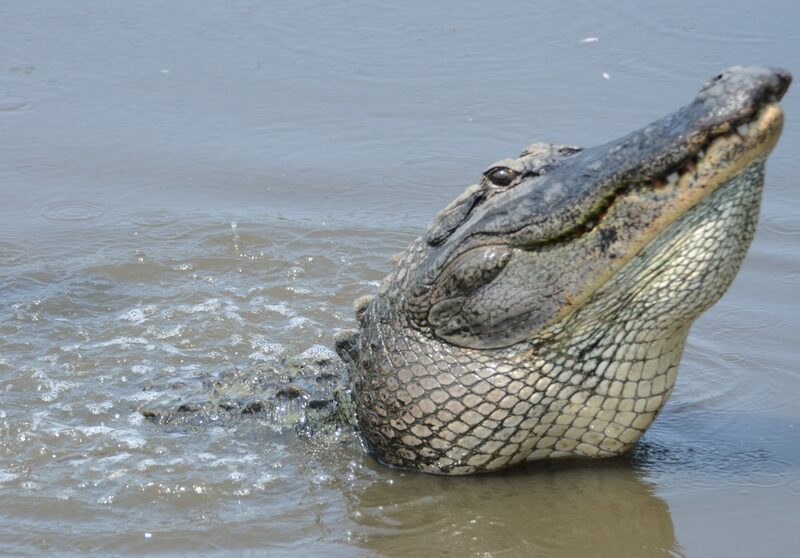 One of the highlights of our trip was a large American Alligator that growled just feet in front of us at Bear Island Wildlife Management Area in the ACE Basin. The bird-life was amazing here. If you have ever seen Bombay Hook National Wildlife Refuge in the height of shorebird migration in late summer, that is what it was like. Everything depends on water levels, however, and we struck avian gold at Bear Island on our trip, which had just enough mud and just enough water to please a wide diversity of species. Were we in Florida? No, Bear Island WMA in the ACE Basin of South Carolina. We saw a single Roseate Spoonbill at this location on our trip. Savannah National Wildlife Refuge was another highlight of our trip. 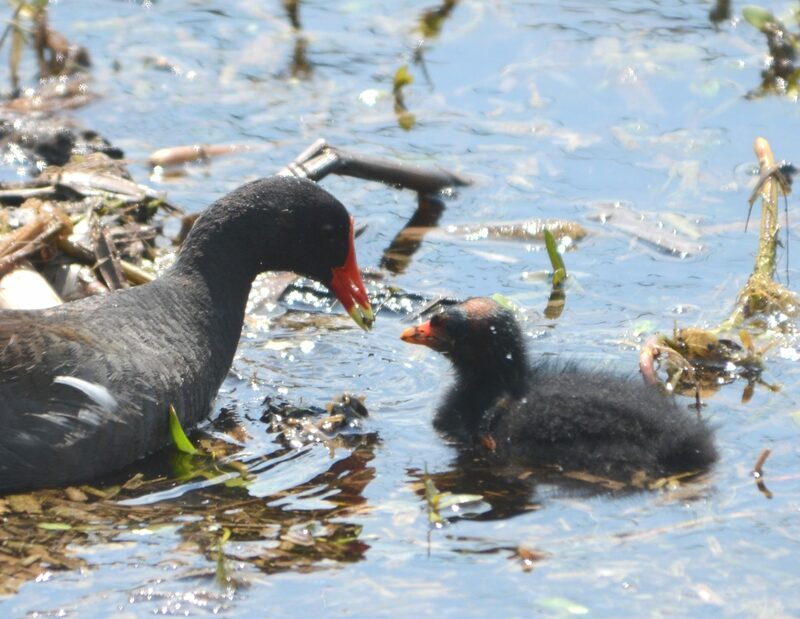 With 29,000-acres of wetlands and bottomland woodlands along the Savannah River, there was no shortage of bird-life. Swallow-tailed and Mississippi Kites swirled above us as Purple Gallinules scooted across lily pads on the water. The refuge has a wildlife drive that we enjoyed, plus we were given special permission to access an area closed to the public where we searched for reptiles and amphibians. At Savannah NWR, Common and Purple Gallinules are easy to find. These odd, but colorful members of the rail family look a bit like a duck, but have huge feet for walking across lily pads and through vegetation-choked water. We were lucky to be escorted by Chris Marsh, Executive Director of the Lowcountry Institute and an expert naturalist, and Tony Mills, their Education Director and a well-known herpetologist and co-author of the book, Lizards and Crocodilians of the Southeast. 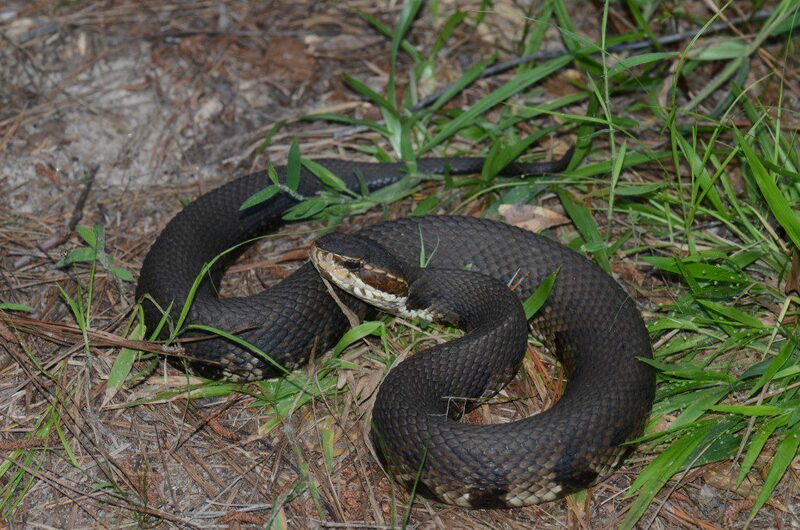 We found 3 Cottonmouth snakes on our trip, including this one at Savannah NWR. Having two expert Herpetologists in the group, Jim and Tony, was a great learning experience. Plus, they LIKE handling poisonous snakes, and know how to do it properly. Finally, we took a boat excursion to Tomkin’s Island, which is an island made of dredge spoil on the SC/GA border. A huge number of birds were resting and nesting on the island. A large breeding colony of Royal and Sandwich Terns occupied this man-made place. Brown Pelicans were nesting there as well, and some non-breeding American White Pelicans kept them company. A wide range of shorebirds were stopping by to feed on their migration, including Red Knot, Ruddy Turnstone, Sanderling, Marbled Godwit, and many others. On the way back to the mainland, Dolphins swam to the boat to take a closer look at us. 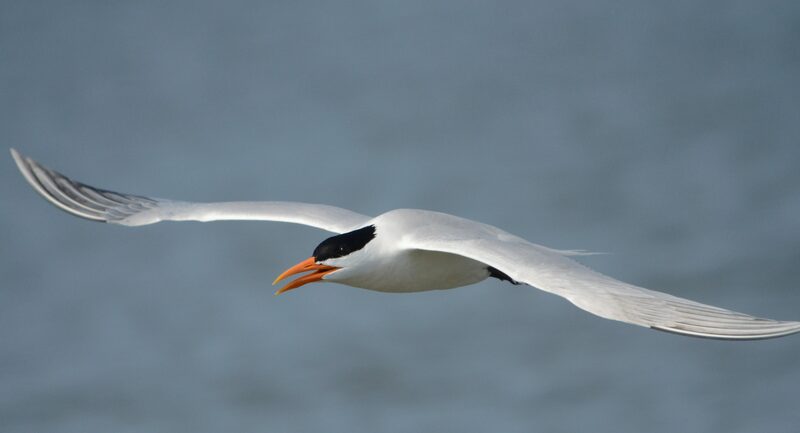 Royal Terns nest on Tomkin's Island in huge numbers. They are joined by their smaller cousin, the Sandwich Tern. 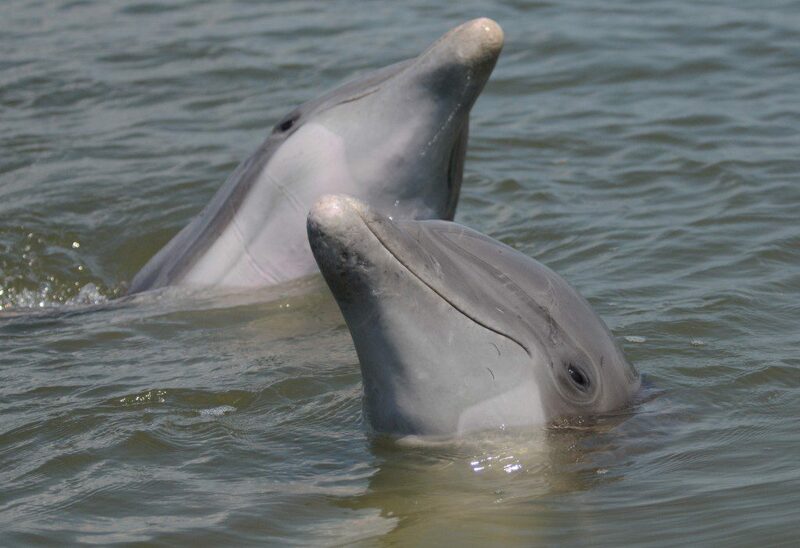 In the back marshes near Hilton Head Island, Bottlenose Dolphins came over to investigate us. This trip is still in the draft phase, but you can experience these sights yourself when we offer this for next spring. You can expect to visit all of these locations, as well as the historic cities of Charleston, Savannah, and Beaufort, plus the Webb Wildlife Area for Long-leaf Pine ecosystem and the endangered Red-cockaded Woodpecker, as well as the historic Magnolia Gardens and Plantation…one of the most famous and beautiful plantations of the south. Jim White will be leading the trip, and we look forward to sharing it with you. Today while participating in a school field study at the DuPont Environmental Education Center, a student caught a young Amercian eel at a stage known as an elver. 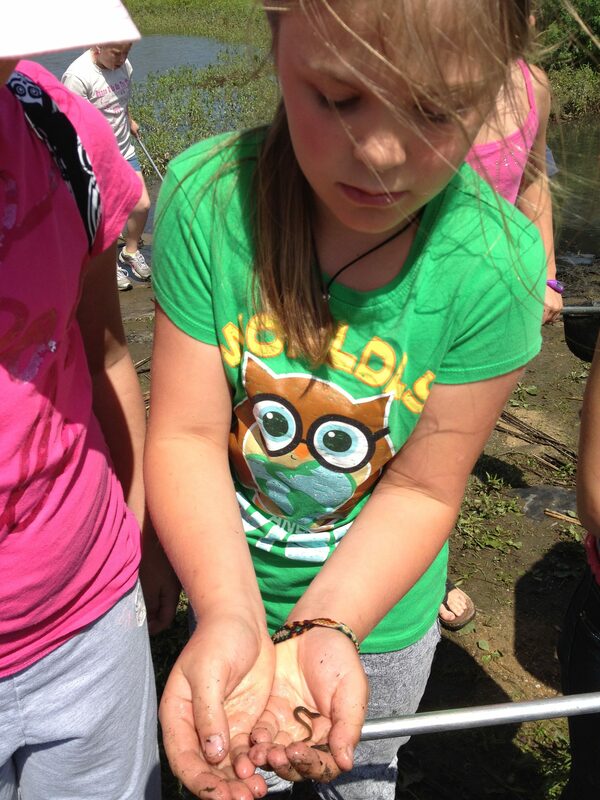 A student holds an American eel elver. Photo by Lesley Bensinger. The American eel hatches in the ocean waters of the Sargasso Sea in the North Atlantic between the West Indies and the Azores. It moves from its birth place to mature in fresh or brackish water and then returns to the sea to spawn. American eels range from Greenland to South America, occurring in all major streams along the coastline. Join us at DEEC Tuesdays – Sundays at 2pm for a free netting program to see what you can find in the marsh. For more sightings follow DEEC on Twitter. A Meadow Vole sitting under a picnic table at Ashland, chewing grasses with its sharp incisors. Image by Derek Stoner, May 15, 2012. On May 15, we had a very interesting visitor to the staff picnic tables at Ashland Nature Center: a Meadow Vole! The small rodent showed no fear of humans and allowed for close approach. With digital camera and video camera, I recorded the tiny rodent chewing on the grasses that it gathered with its tiny forepaws. 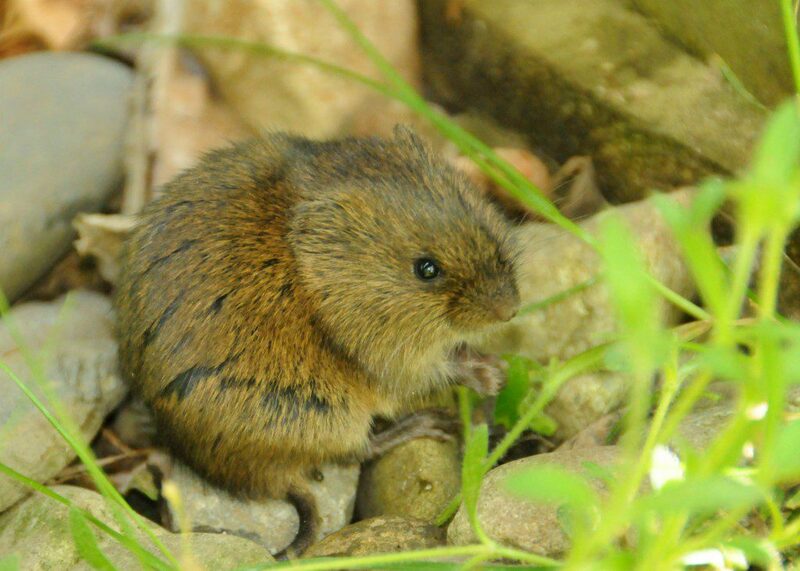 Typically Meadow Voles hide under the grass and leaf layer of dead vegetation, in order to avoid the eyes of predators. 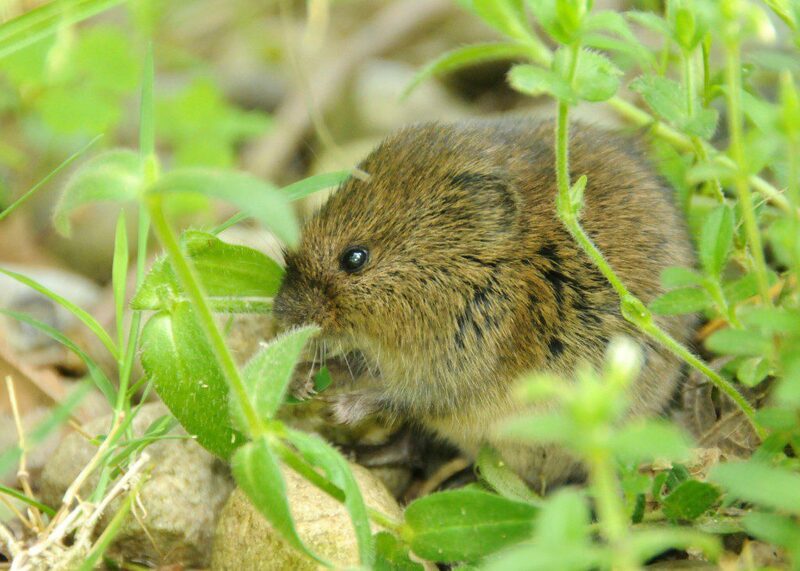 The Meadow Vole clutches the blade of grass in its right paw while it pushes the vegetation into its mouth. Image by Derek Stoner, May 15, 2012. Meadow Voles are one of the most abundant small mammals that live in this region, and they are an incredibly important part of the food chain. Studies have shown that they can occur at densities of more than 400 per acre! Meadow Voles have a remarkable reproductive output that earns them the distinction of the world’s most prolific mammal. Females can breed when they are a month old and produce litters of 3-10 pups every three weeks for the rest of their lives. A captive female produced 17 litters in one year! Animals like Red Foxes, Striped Skunks, Red-tailed Hawks, Great-horned Owls, Barred Owls, and Barn Owls all rely heavily on Meadow Voles as a prey item. These rodents are perfect “protein packages” that supply the majority of meat to predators in our local meadow ecosystems. Enjoy this video of the Meadow Vole munching away under the lunch table– matched to appropriate music for this mysterious hero of meadow habitats!